On this page is a brief introduction in how these techniques can increase the pace of a lesson, provide evidence for important assumpotions made in chemistry such as particel size, lower demands on a student’s short term working memory and lead to an understanding of chemistry at the nano-level. It is very much work in progress. When I saw the Alex Johnstone Triangle for the first time, it was a light bulb moment. All those issues which made chemistry difficult to teach were encapsulated into a simple diagram. The Macro corner is what we visibly observe. It is what students (and teachers and lecturers) enjoy. It provides the “oooos “and “aaaarghs” in lessons. Once the other corners are introduced, the love affair with chemistry quickly dies off. The nano-level interpretations using molecules and ions along with the formation of bonds between atoms and ions or between molecules is difficult enough. When another layer of confusion is added regarding symbols, equations and calculations are added, no wonder the majority of people find learning chemistry difficult (and many us find teaching it tricky as well). The diagram on the left represents my extended version of the Alex Johnstone Triangle. I have added an extra section, “Relevance”. This is not new, it has been done before. By adding “Relevance” to teaching the subject, we need to address the students who, would say, “Precipitation? Why am I bovvered?” Nothing new in this. Every teacher of every subject needs to address the question of "Relevance". I remember asking the same question about Latin. Time is needed in lessons to carry out these aspects of teaching. Microscale techniques provide you with that time. Usually, in carrying out precipitations we provide the student with two clear, often colourless, liquids. There are added in a test tube and a white or coloured solid appears. Something out of nothing? Magic? No. The student has not seen the original solids dissolved in the water. Part of the evidence is missing. 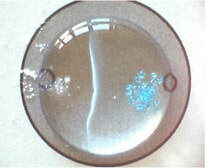 Solid copper sulfate and sodium carbonate are pushed into the 2cm diameter "puddle" of water. The solids dissolve and then a solid (called a precipitate) appears in the middle of the puddle. Students can now use a model of ions, water, solvation etc to try and see what is happening at the nano-level. 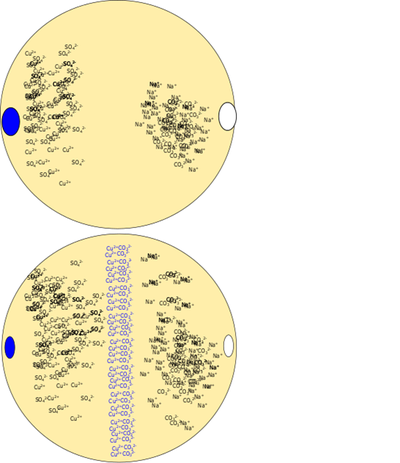 Teachers can now challenge the students to explain the observation at the nano-level. This is a big challenge! Lead or silver nitrate with potassium iodide produces a striking result. The effect can be see in complexes as well. Try iron(III) nitrate and potassium thiocyanate for a striking effect. The number of independent items that can be remembered is between 5 and 9 items. In addition, we require students to remember the point of the lesson a few days after it has taken place. There is a lot more going on their lives than that chemistry lesson! This all begs the question "Are we teaching children to be chemists or are we trying to teach them about chemistry". With these approaches, we are removing the paraphernalia which will be important later (techniques and some skills for exams) but is not necessary in the short-term to understand chemistry. One aim, as teachers, is to enlarge the long term memory with the correct information that can be channelled back to the short memory to provide student with a response back to the teacher (or the examiner). We have to develop tricks in the LTM so that more information can be retrieved than expected. Modelling, information in diagrams, videos, chunking (all sodium, potassium and nitrate salts are soluble in water) and repetition are such examples or tricks. Progression in practical work is as important as progression in teaching. Microscale helps in removing the paraphernalia that occupies too many of the slots in the short-term working memory, thus obscuring the chemistry you want students to learn. Complaints come that is not a titration how it will be assessed in an exam but students can graduate to this. mass of the vial plus 1 drop of indicate plus the 1 ml of the solution whose concentration is required. mass of the vial plus 1 drop of indicate plus the 1 ml of the solution whose concentration is required plus the solution added from the pipette. So much time is wasted in practical lessons with students walking about collecting materials and using test tubes. Here, the sheet with instructions is inserted into a plastic folder (or laminated). The reactions are carried out on the plastic in “puddles”. Students can photograph the results for their notes. (See picture at the top of the page) Each activity would use over 30 test tubes, but here some students could even work on their own. These activities, such as indicator colours, precipitations, displacement reactions can also be done in well-plates, but having the instructions in full view under the experiment, reduces load on the short-term memory, and hopefully some of what they do, is retained in the long term memory. There are two below for you if wish to download them. Adjust the pH 10 buffer to pH 9 if you wish.. A Borax solution is pH9.2 and can be used. You can edit the word documents as you wish. This makes it your practical and not someone elses. The iron chemistry tries to show all the properties associated with a transition element. Cracking on a test-tube scale takes many minutes to set up and there are serious safety issues. This microscale cracking arrangement can be set up and finished in 20 minutes allowing the teacher to complete the discussion of the chemistry within the time-frame of the lesson. Water is at the centre of understanding chemistry in school. It is called the universal solvent although does not dissolve everything. An important demonstration is the deflection of a fine stream of water from a tap or plastic beaker with a small hole in the base, using an acrylic rod. No rod? So use a balloon or even a nylon comb. These need to be rubbed with a dry towel or cloth. The model we use to explain this at the nano-level is to say that the electrons in the water molecule are distorted so there is a prevalence of charge at one end compared to the other. It is this attraction of water molecules to ions or to other polarised molecules and bonds which allows water to dissolve substances. Particles so small that you cannot see them but chemists have to interpret chemical events on these particles. That is a big jump in a student's thinking.